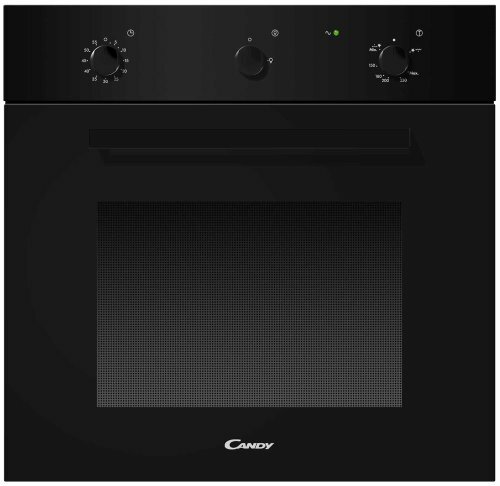 BRAND NEW (Fully Factory Sealed) Candy OVG505/3N - 60cm wide Built-In Fan Assisted Gas Single Oven with Gas Grill ...in Stunning Black! Large 59 litre Built-in Fan Assisted Gas Oven with 2 shelves in a choice of 5 positions Oven Light Auto Gas Ignition for the oven from the fitted power cable Gas Grill Minute Minder Timer Flame Failure Safety Cut Out system Easy clean liners in the oven for easy cleaning (and an easy life!) Glass door on oven - cool touch (double glazed) Easy to use control knobs Fascia cooling system Roasting Tray/Grill Pan 1/2 BSP Gas Connection Unit dimensions - H 597mm x W 595mm x D 550mm 'Full peace of mind' manufacturers 12 months Parts & Labour warranty & 5 Year Parts Guarantee.